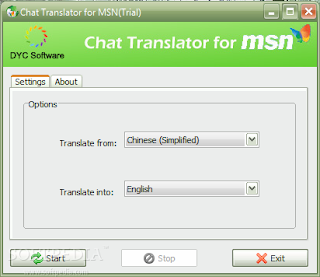 Chat Translator for MSN is a gtranslation plugin for MSN. With this instant chat translation software for MSN, you can send your messages with more tha 20 languages translation. This real-time MSN Chat Language Converter fully supports 7.0 and above versions of Windows Live Messenger. • Supports various languages such as English, Chinese, French, German, Russian, Chinese, Italian, etc. • Transte and chat in the same window for easy and simple operation. • Choose either to send oringinal and translation or translations only to your friends. • Received messages are also with your laguatranslations • Easily change the language you want to translate or be translated. • Stop and start translation anytime. • Free life-time upgrade and technical support.